If you're a fan of my face book page, you may remember last Spring I made one of these beautiful DIY Tiered Planters pictured to the left. Since making that planter I've learned a few things, so this year I gave it another try and the results were fabulous! Tiered Planters are perfect for spring, so when Walmart challenged me to create a project using their Rust-Oleum American Accents paint I knew exactly what I wanted to make. First off I love the color choices, Colonial Red and Green Eden. I think they complement each other perfectly. I was so impressed with my new large tiered planter, that I made an additional small planter to go along side. I think adding our house number was a nice touch. What I learned since making the last tiered planter is it's best to treat the inside and outside of each pot with clear water sealant. Last time I only treated the inside and the paint ended up bubbling. This time I also went with a different brand of spray paint, I used Rust-Oleums American Accents Ultra Cover 2x. The Rust-Oleum spray paint gave me twice the coverage as regular spray paint with a fast dry time. It's also non yellowing and UV resistant which is great since my planter is placed on the front porch. The American Accents paint is ideal for indoor and outdoor project with wood, metal, wicker and more. The color choices at Walmart were awesome, so it was easy to pick out just what I wanted. After sealing the terra cotta pots inside and out, I painted each one with my choice of colors and let them dry. Once they were completely dry I finished them off with a final coat of clear sealant inside and out. Hopefully this will take care of the paint bubbling issue. It's best to let the planters dry a day or two before assembly and planting. Once dry then the fun of planting all those beautiful flowers comes in. I chose petunias and marigolds, because they seem to weather best here in Texas. I have included some step by step photos, so you can make your own Tiered Terra Cotta Planter. I think these planters would make a wonderful Mother's Day gift. I found everything I needed for this project at my local Walmart. 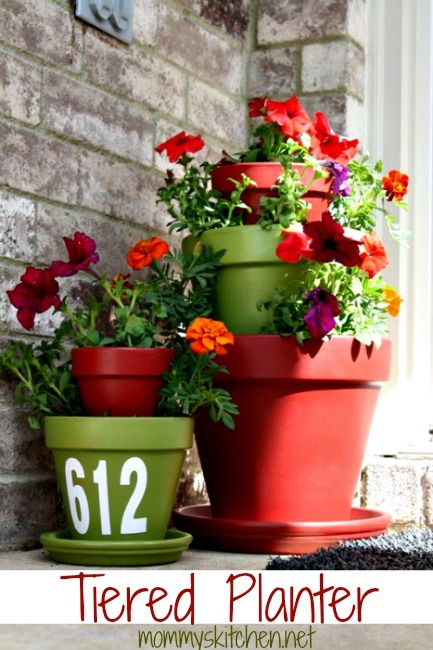 You'll need terra cotta pots in 3 different sizes, 1 large terra cotta saucer for largest pot, clear protective sealant, spray paint in 2 colors, rocks, bricks, empty soda cans, potting soil, flowers and vinyl numbers (if you want to add a house number), drop cloth or newspaper to cover your work area. Start by covering your work area with a large plastic drop cloth or newspaper. As you can see from the photo above I did not do that using the sealer LOL. 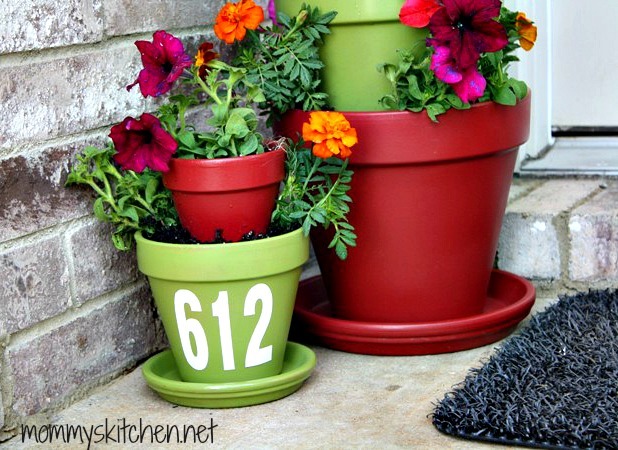 Place the terra cotta pots on the drop cloth and seal the inside and outside of each pot as well as the saucer with the clear matte sealer. Allow the sealer to dry thoroughly before painting. Using a thin coat of gloss exterior enamel spray paint (I used RUST-OLEUM American Accents Ultra Cover 2x). Paint the entire outside and about 2-3 inches of the inside of all 3 pots. I actually did a light coating on the entire interior surface. Let the pots dry completely and then add a second coat in any spots that look uneven on the outside surface. After the paint dries apply a second and final coat of sealer inside and out. Let the pots dry at least one day before planting. Add a bit of potting soil to the bottom of your large pot. Add a large rock or brick to the bottom to elevate the second pot. Place the second pot on top of the brick or rock and add some cans around the outer space (for drainage). Do the same method with the second pot to elevate the smallest pot the same way. I just used soda cans instead of another brick. 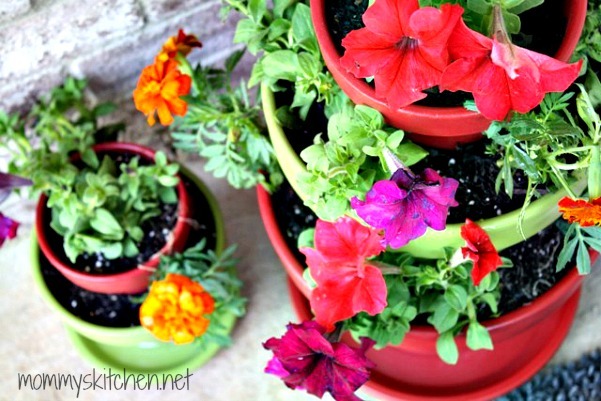 Finish off by adding dirt into each of the pots. Add your favorite flowers and enjoy. I love the colors that I chose. Start by covering your work area with a large plastic drop cloth or newspaper. Place the terra cotta pots on the drop cloth and seal the inside and outside of each pot as well as the saucer with the clear matte sealer. Let each pot completely dry. The clear sealer, seals the pots and prevents moisture from leaking through to the outside after painting (important not to skip this step). Allow the sealer to dry thoroughly before painting. To paint the pots use a thin coat of gloss exterior enamel spray paint. Paint the entire outside and about 2-3 inches of the inside of all 3 pots. I actually did a light coating on the entire interior surface. Let the pots dry completely and then add a second coat in any spots that look uneven on the outside surface. After the paint dries apply a second and final coat of sealer inside and out. Let the pots dry at least one day before planting. Once dry add your house number using the adhesive number stickers. Add a bit of potting soil to the bottom of your large pot. Add a large rock or brick to the bottom to elevate the second pot. Place the second pot on top of the brick or rock and add some cans around the the outer space. Do the same method with the second pot to elevate the smallest pot the same way. I just used soda cans instead of another brick. Finish off by adding dirt into each of the pots. Add your favorite flowers and enjoy. Notes: Work in a well ventilated area outside is best, but make sure to choose a day that isn't windy. This is a sponsored post. As a participant in the Walmart Moms Program I have received a gift card and compensation for my time and efforts in creating this post. All thoughts and opinions stated above are 100% entirely my own. Very cute Tina! Just shared on my facebook page. I did something a little similar last year. Love it! This would look great on my porch. Will give it a try. VERY nice Tina! Love the layered look, the colors, and adding your house number was a wonderful personal touch. I love it all. Thanks Tina for this post. i made these a couple of years ago and had the paint bubbling issue as well and had to repaint last year. I am going to try this brand and see if I have better results. I love this green and will use as well - thanks again. Cant Find This Green Anywhere! Tried 3 WalmartS And Menards! Frustrated! You might just have to pick a green that resembles the Green Eden. I know there is a regular Rustoleum Paint that comes in Green Fern and it is really close to the Green Eden. What were the sizes of your pots? These look terrific! Love the colors! I do have a suggestion to try. Paint over the numbers or words for example Welcome! (if you use them) with Glow in the dark paint! Adds a really neat effect! That's a great idea Layna!